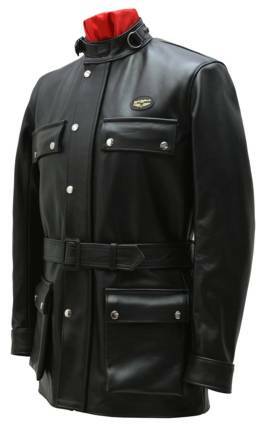 The Roadmaster first appeared in 1973 as Lewis Leathers top-of-the-range all-weather trails and touring jacket. The mid 70s saw the introduction of the Mk2 version, the same jacket but with the addition of shoulder and elbow padding, which was quickly adopted by many of the British motorcycle police forces; the added epaulettes allowed for the application of the police riders’ numerals. This luxury jacket is made from supreme hide for real rugged wear. Packed with features, the Roadmaster has ample length depending on your chest size and stylish tailoring with a smart all-round belt to add good looks and practicality. There are four capacious press-studded pockets for all your needs ( the two top pockets also have zipper closings under the flaps ) and an interior zippered wallet pocket. The front has press fasteners and a heavy zip to insulate against the wind and the fully adjustable collar is lined with corduroy for warmth and the quilted sailcloth lining will keep you snug. Please note that larger sizes are available but are subject to surcharge of 30% for 46″ & 48″ and 40% for 50″ & 52″. Both styles are still available today – please email us with your preference when ordering, using the “Contact Us” option above.